Oh, I'll just do it tomorrow. What is always coming, but never arrives? Tomorrow. Because when it gets here it is today. Making decisions or completing tasks on time can be a struggle for me. Not due to being lazy or irresponsible, because my mind is full of options and possibilities. Choosing just one can be problematic for me. It's easy to avoid making decisions because I am an over thinker. I obsess and dwell in the depth of my own mind. It's never too late to start over. If you weren't happy with yesterday, try something different today. Don't stay stuck. Do better. Organize that toy collection. Finish that next Cosplay. Get that project started. Pick one and do something already. 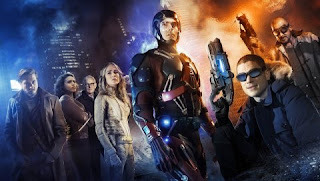 Who's planning on watching Legends of Tomorrow?